Uninstall SentryOne through the Control Panel in Windows. Before uninstalling, consider visiting SentryOne Support with questions or concerns. 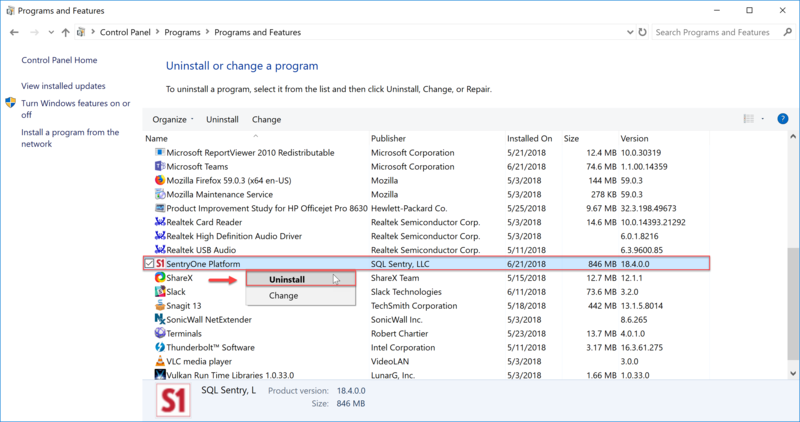 Select Uninstall a program under the programs section. Double-click the SentryOne application, and select Yes to uninstall. Note: When you uninstall the SentryOne client or monitoring service, the associated program files are removed. User preferences stored in the registry, and the SentryOne database aren't deleted. Important: The .NET Framework files will not be removed when uninstalling SentryOne. Use Add/Remove Programs in the Control Panel to remove .NET Framework files. Important: Please see the Removing Watched Server Objects article for scripts to remove the watched server objects from the target(s) after uninstalling SentryOne. Note: When you watch events on a SQL Server, SQL Sentry places a few objects in MSDB that facilitate its lightweight polling architecture. No agents are placed on the server. This enables SQL Sentry to monitor the server with a performance overhead that's typically less than SQL Agent. For more information about watched server objects, see the Watched Server Objects topic.